He opined that Commissioner Gary Bettman turned his back on him, and that the NHL Player’s Association, of which he was a member, did nothing to support or protect him. Further, that the Colorado Avalanche, “his team”, treats him as if he doesn’t exist. “Biting the hand that feeds you” is a well-worn adage, indicating, of course, a spirit of ingratitude toward acts of generosity; specifically turning against a benefactor or supporter. Its origin is obvious—if an animal bites one’s hand when being fed, there is an unlikelihood that he will be fed again. The antithesis of that is expressed in the title of this column. Recipients of philanthropy have often turned on providers—it may well reveal their true spirit which has been lurking in the shadows all along—but it seems totally uncharacteristic that a the opposite scenario could exist. Unfortunately, management in pro hockey circles has often been guilty of that very thing. And, the more money or prestige which is at stake, the greater the tendency to act heartlessly. While it may be unfair to use the term “typically”, nevertheless there have been two rather obvious examples of this harshness in the last few weeks. On January 25th the Winnipeg Jets hosted the Maple Leafs in the Manitoba capital. Not surprisingly, James Reimer, a native of that province, was chosen to start between the pipes. But, this time rightly applying the word “typically”, the Buds started off the game flat-footed, with numerous give-aways in their own end, resulting in Mr. Reimer being treated like a duck in a carnival shooting gallery. Though he had little or no chance on the early shots which eluded him, in front of a myriad of friends and family he was yanked and replaced by Bernier. If justice had been administered, the defense corps should have suffered that public embarrassment rather than the young vulcanized backstop. As the March 2nd Heritage Classic match in Vancouver approached, the press focused on Roberto Lunogo’s gearing up for this milestone extravaganza. He was pictured breaking in new pads, sporting the heritage colours worn so long ago by the 1920’s Millionaires. But when the big moment came, the one-time Olympic hero was relegated to the end of the home team bench, and the unproven Eddie Lack took his place in the national spotlight. In both cases, “let down” seems inadequate to describe the feelings of these embattled warriors. The obvious bitterness expressed by these shinny professionals bares the callousness involved in dozens of incidents easily excavated from the archives of NHL history. In the fall of 1946, Herb Cain was just coming off a successful season, during which he had scored the 200th goal of his career—no small feat in that era. At age 33 he felt he could play for at least another three seasons. But his boss, the Bruin’s Art Ross, saw it otherwise. Even though he acknowledged the veteran left-winger could make the team, he banished him to Hershey of the AHL. Cain knew four other NHL clubs wanted him, and two had actually tried to buy him from Boston. But that was the year the player’s pension system was activated. One more campaign with the Beantowners and Herbie would have qualified for these benefits. By demoting him, Ross conspired with his league cohorts to make sure not one dollar from the NHL treasury would go Cain’s way. In 1954, as a fourth-year skater with the Toronto, he made the mistake of falling in love. He purchased an engagement ring, and eventually married Margaret Gordon, a nurse at the Sick Children’s Hospital in Toronto. That coincided with his 46th game as a Maple Leaf. Manager Conn Smythe took a dim view of wedding bells during the season, and demoted the expert poke-checker to the minors. When he objected this treatment, the “Little Major” kept him on the farm for the duration of the season, and then sold him to Montreal. In the spring of 1958, Bert Olmstead, who was considered the epitome of grinders by both friend and foe, was recovering from torn ligaments in his knee. When the crunch came in the Stanley Cup finals, he admitted to coach Toe Blake that the limb was not 100 percent. Even though he had played through the opening match of the series, he was promptly benched for the duration. Feeling he was being phased out he asked for a coaching position, but his request was rejected. Instead, he was exposed to the intra-league draft, ending up with the Leafs. He spilled out his bitterness with these words: “Hockey players these days are nothing but white slave labour!”. The rancorous treatment by some executives was illustrated dramatically in the fall of 1959. Detroit’s Jack Adams dropped the ball big time in the way he mishandled 23-year-old Billy McNeill. Despite the fact that the young winger’s pregnant wife had contracted polio and was hospitalized, he was told that he was “needed” by the team for a game in Chicago. While he was away, his wife died! Devastated by his loss, his performance lagged—so Detroit attempted to trade him to the Rangers. Bobby Baun also experienced mistreatment by those same Motor City moguls. In 1971 his tenure in Detroit came to an ignominious halt. 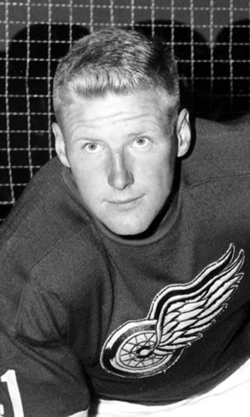 He had skated for the Red Wings on November 1, but the next morning, when the team gathered for practice, they noticed that there was no sweater in the Boomer’s stall in the locker room. Not only that, but his number 4 had already been assigned to Larry Brown, who came over from New York as part of the Pete Stankowski trade. Frank Mahovolich commented that it was one of the most hurtful situations he ever witnessed in professional hockey. Goalie Wayne Thomas stood between the uprights for the Canadiens for the majority of matches during the 1973-74 campaign, while incumbent backstop Ken Dryden was on his famed “sabbatical”. He performed well enough to be awarded the Molson Cup, which recognized the most 3 star selections that year. But the following season he was virtually ignored. Although he had a superior goals-against-average, he was replaced by understudy “Bunny” Laroque, travelled with the team, but failed to play even one minute over the course of the 78-game schedule. He couldn’t be sent down without being put on waivers, and the Habs didn’t dare take a chance on that—so he sat. Ron Chipperfield was the first captain of the Oilers after the WHA version of the squad had been absorbed by the NHL. In March of 1980 he was shipped off to the Quebec Nordiques. This trade rook place while the steady-going centre was visiting his terminally ill mother. Every one of the Alberta-based sextet was shocked by that one, but realized that with Glen Sather the team came first, with a capital “F”! Still with Edmonton—no hockey fan will ever forget that fateful day in 1989 when the news broke that Wayne Gretzky had been traded to Los Angeles. But for “the Great One”, the blow came earlier. It all started at the Awards dinner that spring. “Mr. Wayne-derfull” was to be presented with his eighth Hart Trophy. When people lined up to shake his hand, two key members of the Oiler’s organization were conspicuously absent—Peter Pockington and Glen Sather. But that was just the tip of the iceberg. Previous the deal, Gretzky was in Bruce McNall’s office, as a result of the latter having been given permission to “talk” to the game’s number one star. While he was there the phone rang, It was Pocklington. The phone was on speaker, and Wayne heard the Edmonton CEO begin to heap trash talk on him—about what a huge ego he had and how selfish he was as a player. He even bad-mouth his father for being “a pain in his side”. In 1982 Paul Mulvey refused to lead his teammates over the boards to join in an on-ice brawl—twice in five days. He was put on waivers at the insistence of his L.A. coach, Don Perry, bringing his NHL career to a premature end. But perhaps the gaff which best illustrates “not needing an elevator to get the shaft” involved “iron man” Doug Jarvis. Having played a record consecutive 964 games, his amazing feat came to an unceremonial end on October 11, 1987. Hartford head coach, Jack Evans told him before game time he was being replaced by someone else. The next day he was shipped to the minors. But forget the “public”. This persevering hero deserved better than a behind the scenes trip to anonymity. It was October 12, 2002, the season opener for the Calgary Flames. It was to be a special evening for Craig Berube, marking his 1000th game in the NHL. Family had been flown in for the event, with the Flames providing hotels and a luxury box for his clan. It had been pre-arranged that he would be honoured at centre ice before the puck dropped to open the contest. But Coach Greg Gilbert made Berube a “healthy scratch” that night. To say the least, the resident tough guy was devastated. It was an embarrassment to himself and his family, and a black mark against the team. Gilbert, for some reason, totally ignored personal feelings and expectations. If there was ever a prototypical case of being “bitten by the hand that fed him” This was it. There are times when one feels inclined to criticize skaters who think nothing of team loyalty in lieu of bigger bucks somewhere else. But in instances like those above, it seems that, at least in many cases, it’s the hand that feed which does the biting.